The Deaconess Ministry of Jerusalem Baptist Church The Deaconess Ministry of Jerusalem Baptist Church, 301 S Sixth St., presents “Women of the Bible with Divine Purpose” on Sunday, March 10th beginning at 4 p.m. Everyone is invited to put on your best garment of praise and worship the Lord with the daughters of the King and guests. Spring Branch Baptist Church singing Spring Branch Baptist Church, 5106 Middendorf Rd., will be having a gospel singing on Sunday, March 31st beginning at 6 p.m. featuring The Norton’s of Lumberton NC. 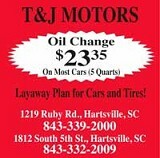 For information, call 843-335-6651. Spring Branch Baptist Church revival Spring Branch Baptist Church, 5106 Middendorf Rd., will be having a revival starting on Sunday, April 7th-10th with Rev. Jerry Devinney. Sunday services are 11 a.m. and 7 p.m. and Monday through Wednesday services will begin at 7 p.m. For more information, call 843-335-6651. Faith Baptist Church schedule Faith Baptist Church, 2316 Faith Road, off Hwy. 151 towards Darlington, invites you to join them for Sunday School at 10 a.m., morning worship at 11 a.m. and Sunday night service at 6 p.m. Wednesday night at 7 p.m. The 1st Wednesday of each month they have “Family night” and start at 6 p.m. There will be food and fellowship and their WMU & Brotherhood meetings. Praise The Lord Ministries schedule Pastor Randy Freeman and the congregation of Praise The Lord Ministries, 824 West Old Camden Road, would like to invite you to attend services each week. Sunday school is at 10 a.m. Worship service is at 11 a.m. Sunday night service is at 6 p.m. Wednesday night service is at 7 p.m. Come worship and enjoy the blessings of the Lord. 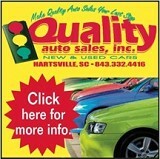 For information please call 843-861-3581. Middendorf Church of The Living God schedule Middendorf Church of the Living God, 2042 Bullard Ford Road, Hartsville would like to invite you to come worship with them. Service times are Sunday 10:30 a.m. and Tuesday night 6:30 p.m.